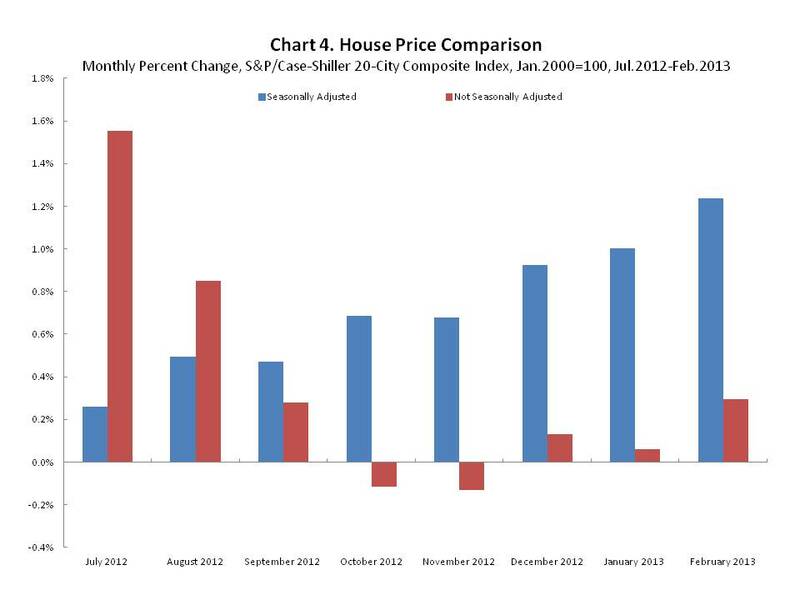 Standard and Poor’s reported that house prices rose in March. 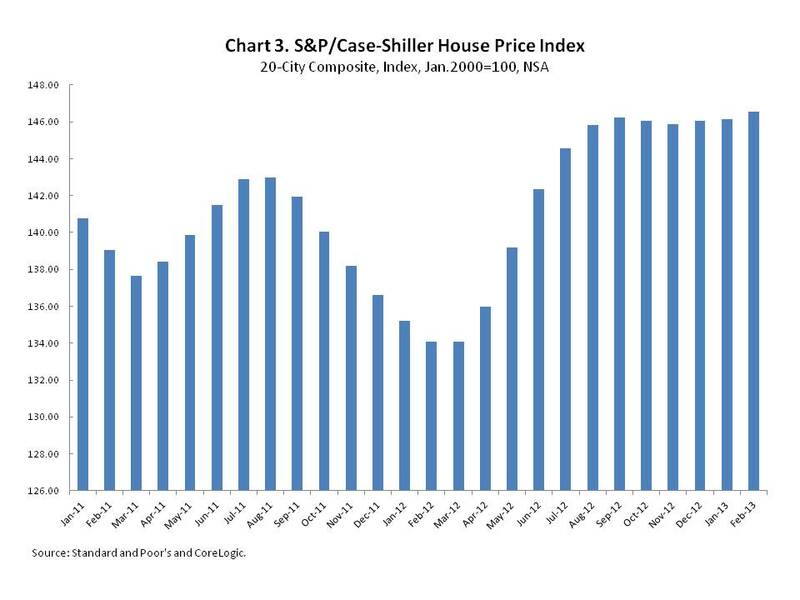 According to the most recent release, the S&P/Case-Shiller House Price Index – National Index grew by 10.2% on a year-over-year not seasonally adjusted basis. 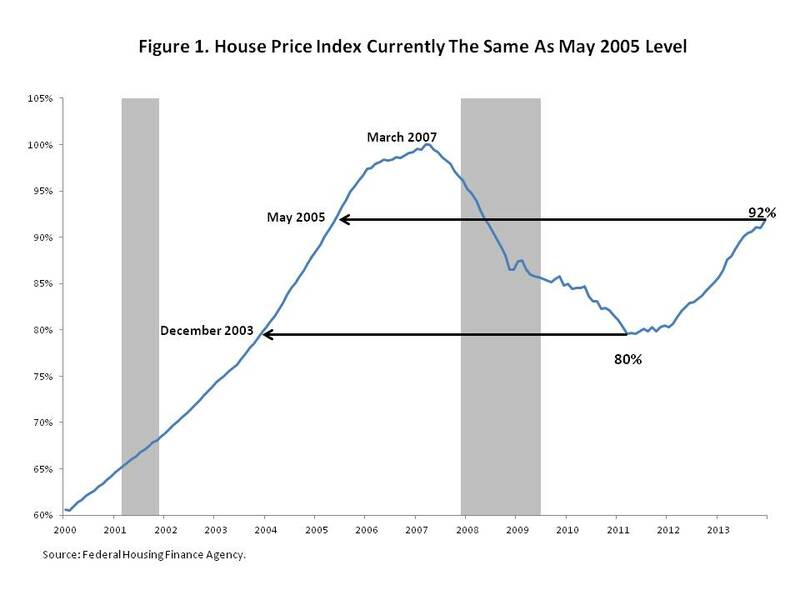 Following 19 consecutive months of year-over-year declines, house prices registered their tenth consecutive year-over-year increase in March. 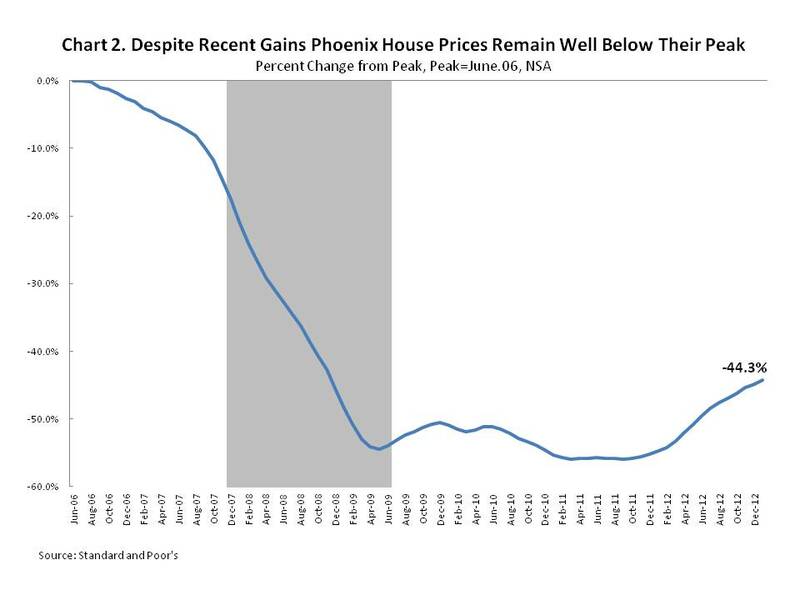 House price growth in Phoenix had the largest annual increase at 22.5%, followed by San Francisco with 22.2% and Las Vegas with 20.6%. 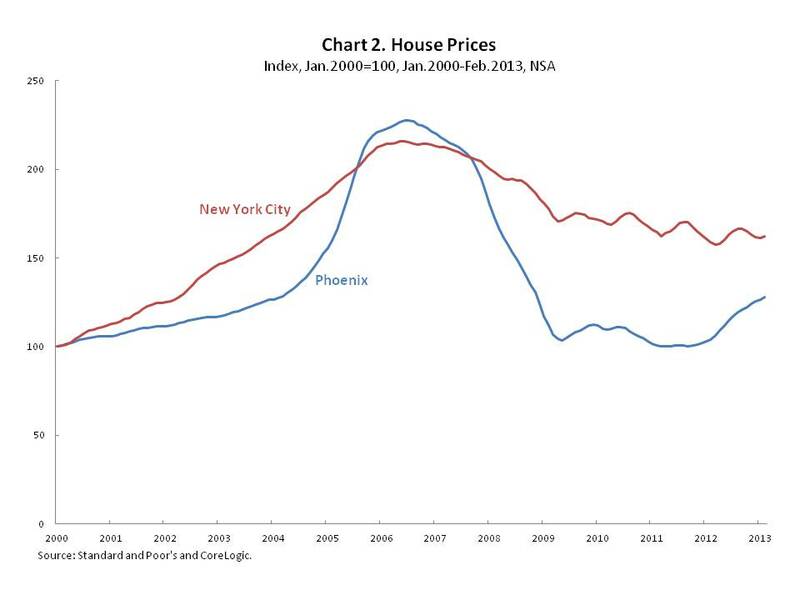 Meanwhile, house prices in New York rose by 2.6% on a year-over-year not seasonally adjusted basis. 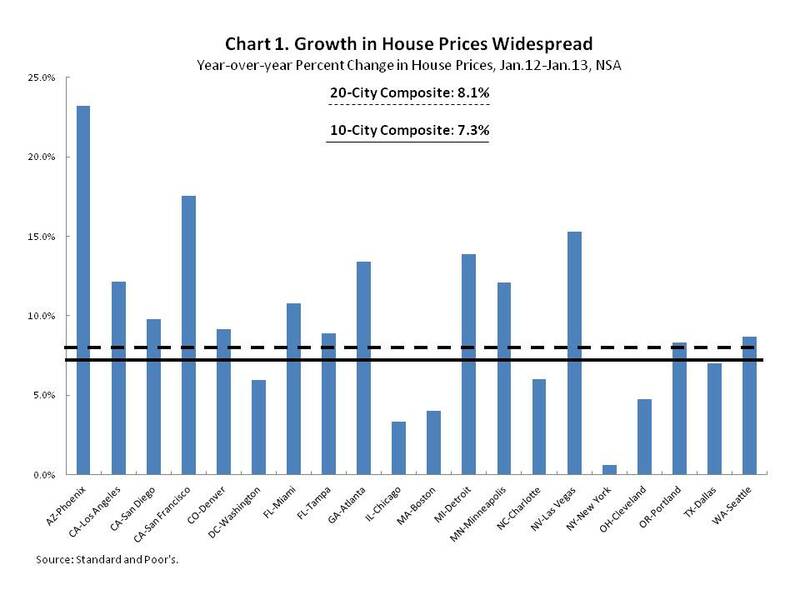 Standard & Poor’s calculates tiered house price indexes for 17 of the 20 MSAs included in the House Price Index – 20 City Composite. 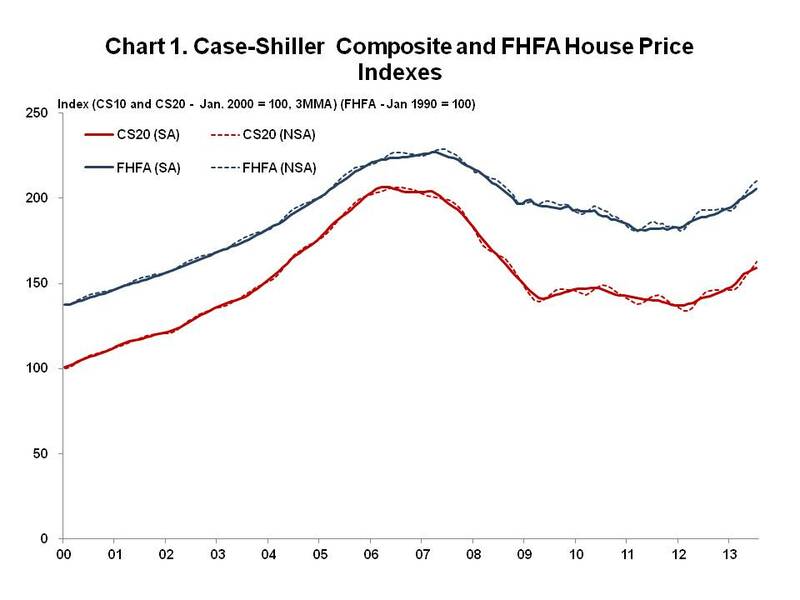 Tiered house price indexes for the Cleveland MSA were not available in March 2013. 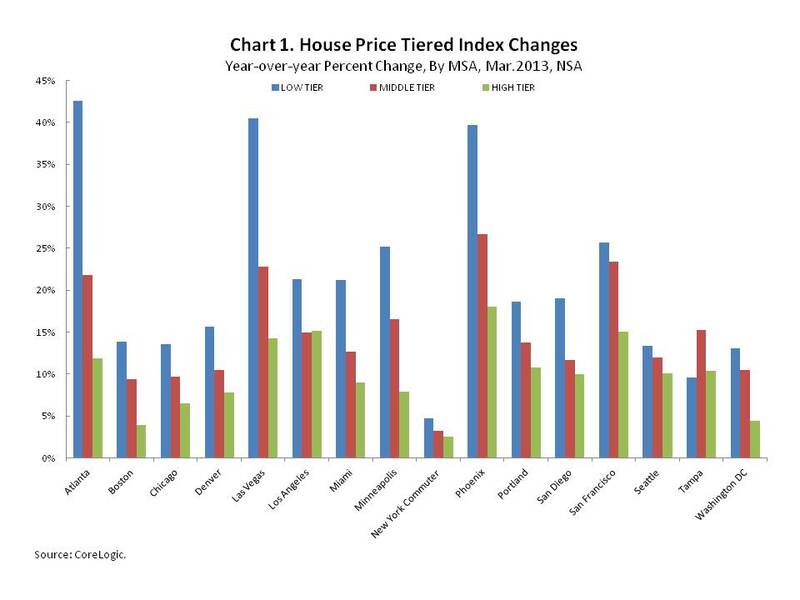 Tiered indexes measure changes in the value of existing single-family houses in three price tiers – low, middle, and high. Each tier represents approximately one-third of the sales transactions in each respective market. 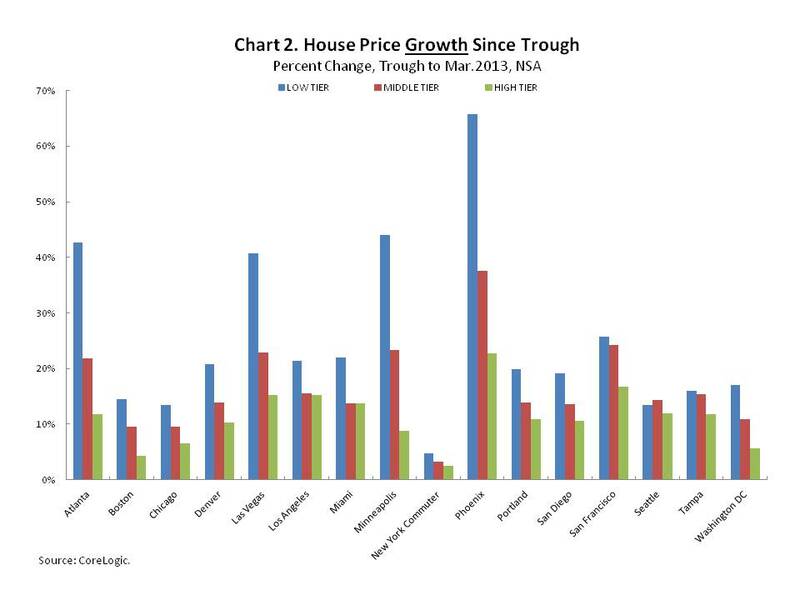 Over the past 12 months, house prices in the low tier have generally outperformed house prices in the middle tier and the high tier. 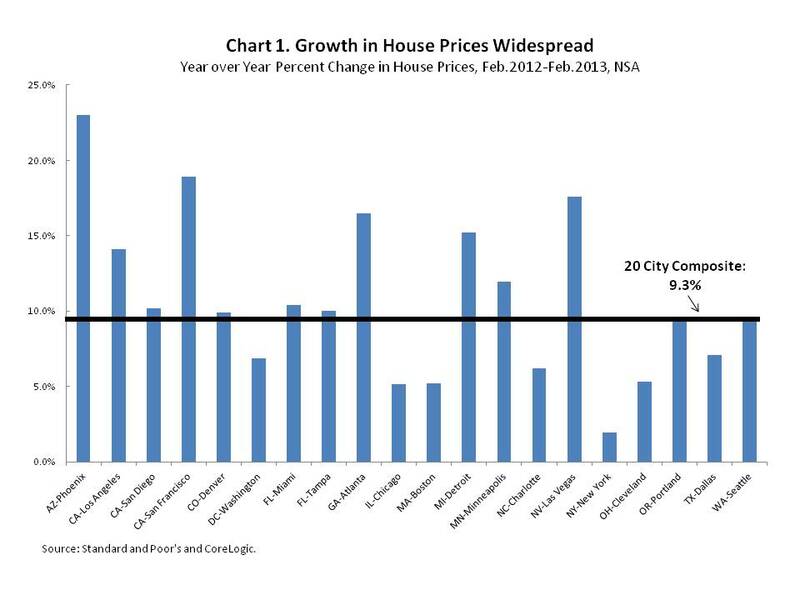 As Chart 1 illustrates, the year-over-year increase in the low tier house price index has exceeded the annual percent growth in the middle- and upper-tier house price indexes for every MSA except Tampa. 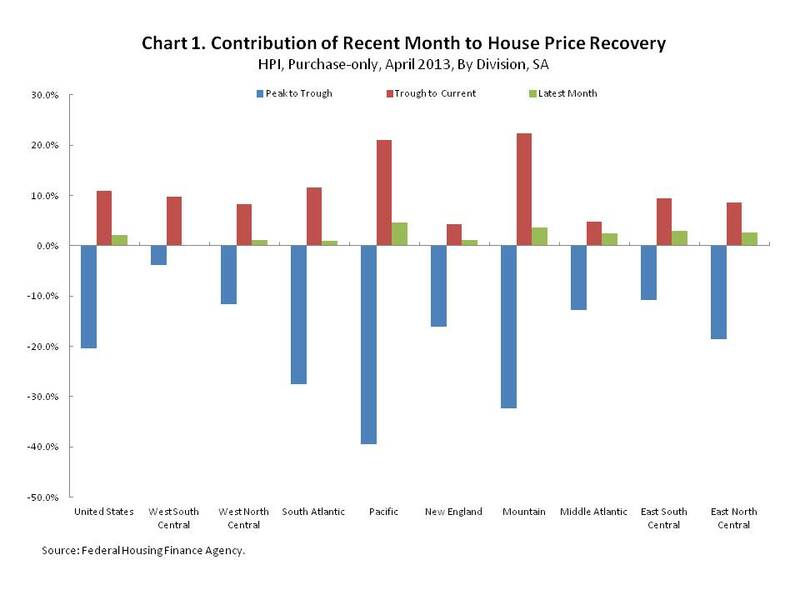 The faster growth displayed by the low tier house prices in March 2013 relative to the middle and high tier is a continuation of the strong rebound exhibited by these house prices following the housing bust. 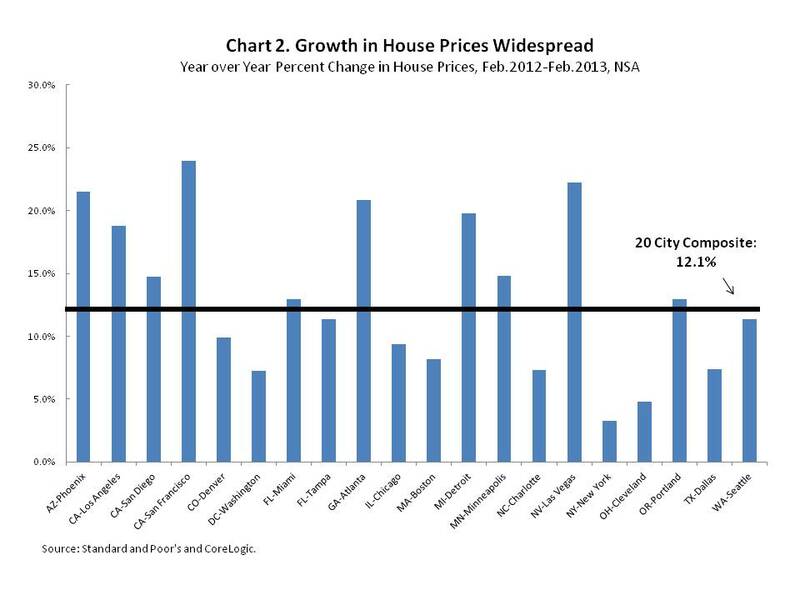 Since reaching its respective trough, house price growth in the low tier has exceeded house price growth in both the middle and upper tier in each of the 16 MSAs except Seattle. 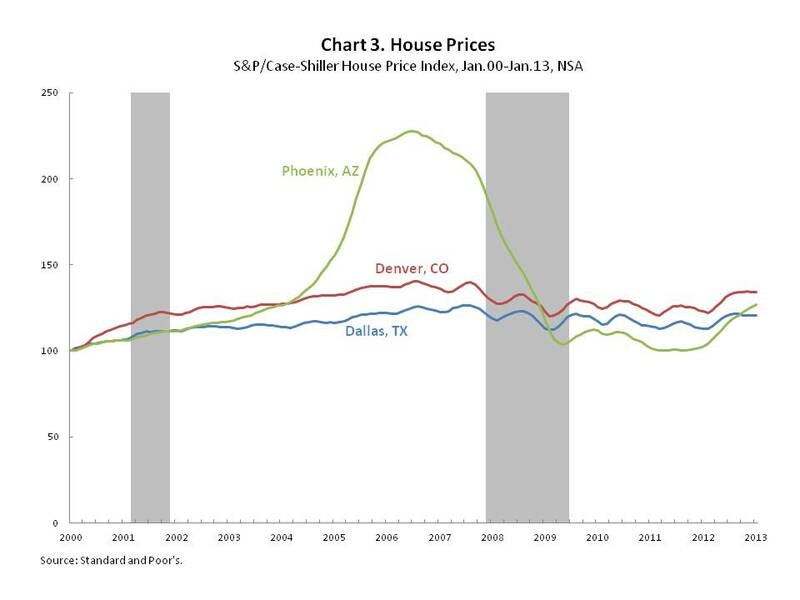 In Seattle, the rebound in middle tier house prices has slightly exceeded the recovery of house prices in the low tier. 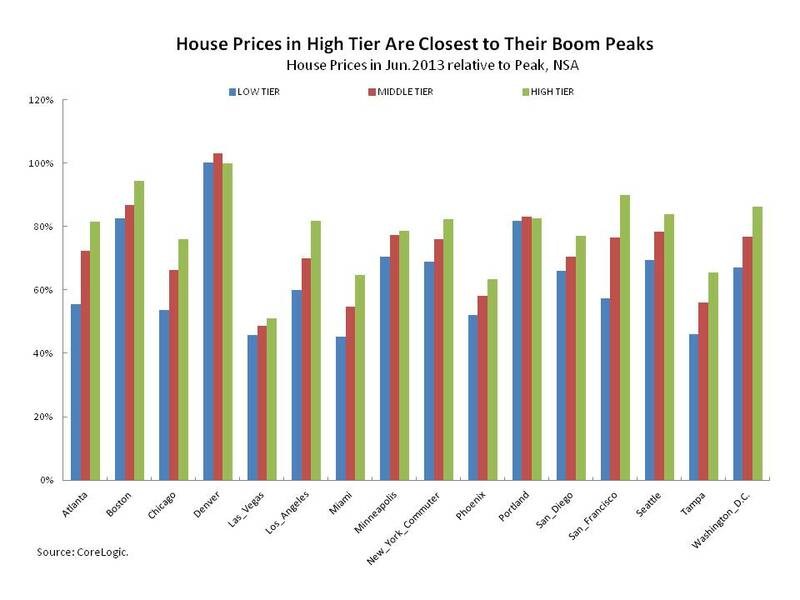 However, the rebound in low tier house prices exceeds that of the high tier. 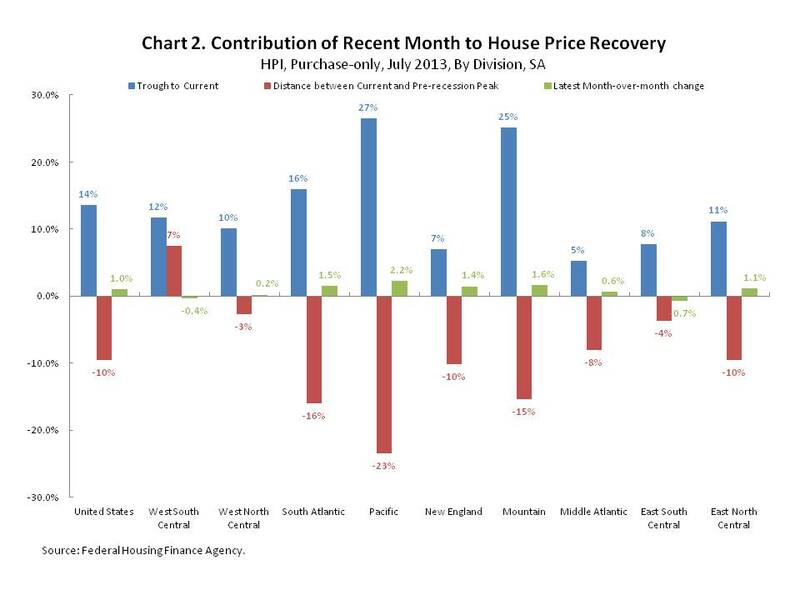 A previous post noted that the strongest house price recoveries have typically taken place in geographic areas where house prices declined the most. 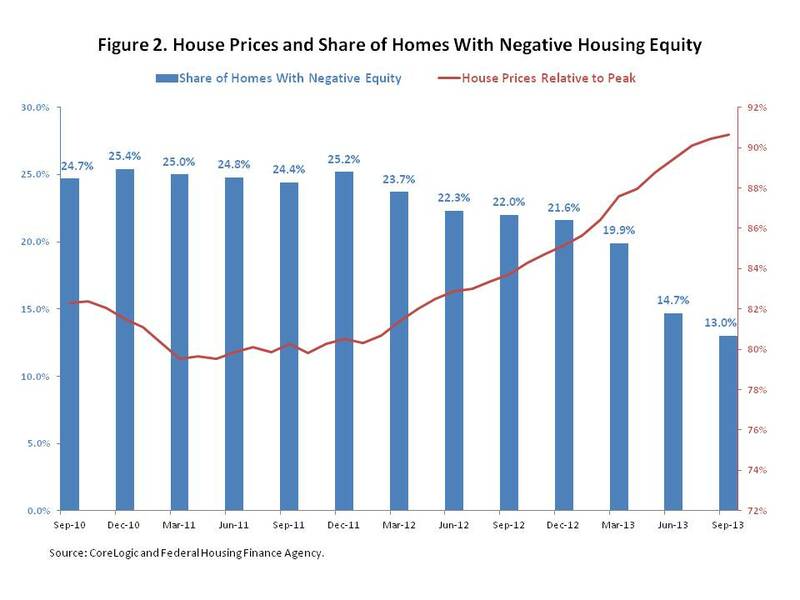 A similar phenomenon is occurring across house price tiers. 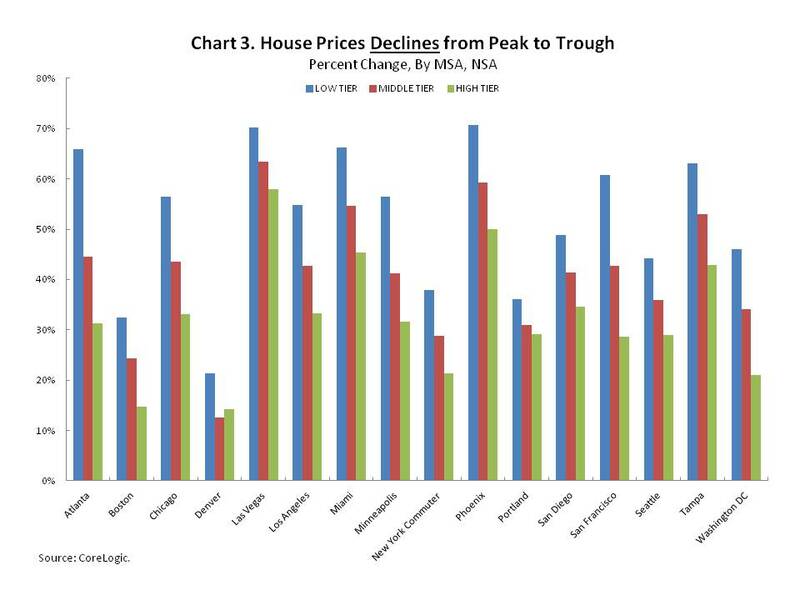 According to Chart 3, house price declines that took place following the housing bust were deepest in the low tier in every MSA for which data is available.